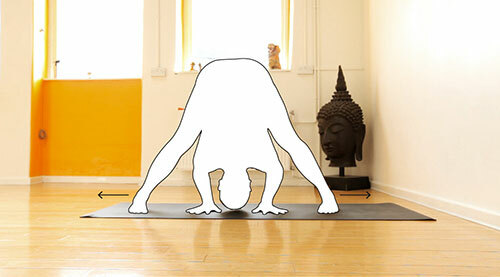 Why the yoga mat is undermining your practice – Brian Cooper – Trippin' Thru! Brian Cooper. Probably the most down to Earth, un-fluffy, says it how it is, yoga teacher on the planet ruffles feathers with the yoga science of the non – mat. Much could be written about the psychological significance of rolling out your mat, with its implications of marking out your territory, creating your own space and perhaps saying something about your personality by the size and thickness of your mat. We will leave this for another article and focus on the anatomical error of mat-dependence. If you are taking a yoga class and the teacher asks to put all props aside, away fly all the bricks, blocks, belts, bolsters and the whole paraphernalia of many yoga classes. But not quite all the props: Few would dream of also removing their mat. And yet they are the biggest, and in some ways, the most pernicious props of them all. They are both anatomical and psychological props, and they are pernicious because few students recognise the role they play in their practice. The general consensus is that props are useful for assisting in approaching a posture, but they should be discarded when it is recognised they are no longer useful and could even be holding a student back. But have you ever heard a student say ‘now I can finally discard my mat, I no longer need it’? NO! 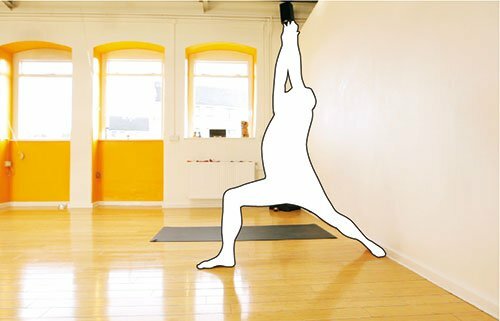 Because students don’t consider the yoga mat as a prop, but a vital piece of equipment to, among other things, protect them from a hard floor, or an unclean or cold floor. Fair enough, but the trend over the last twenty years has been towards the STICKY MAT. Originally produced from carpet underlay to prevent whatever was being used from slipping on the floor, its purpose has shifted to preventing the student from slipping on the mat. One of the most frequent complaints of students who purchase a mat is that they are not sticky enough, and many mats come with instructions on how to get the optimal grip. Most dogs do this without rolling out a sticky mat. 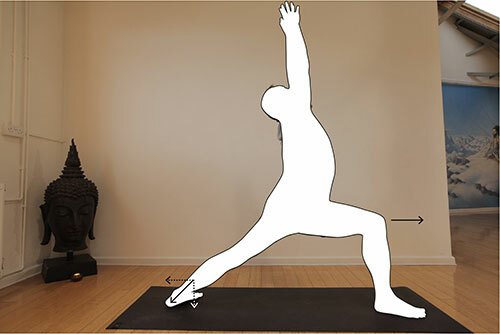 Humans using a sticky mat push their feet away until they are held by the mat, and use the reaction from this to lift the hips and straighten the legs. At the same time, they push their hands into the mat and exploit the hands being held by the mat to lift the hips and draw the head closer to the legs. Hence the typical upside down v shape much admired by humans but not so much by dogs. The photo above shows the usual posture on a sticky mat. The arrows show the overall direction of horizontal force applied to the mat. 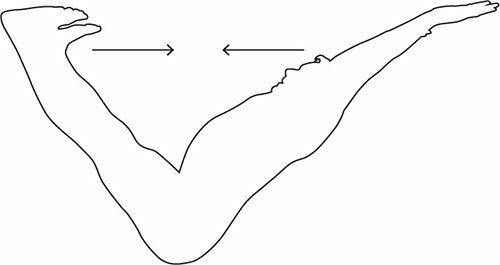 This combined with a downward force of compression results in a ground reaction force which lifts the hips and provides the stability necessary to move deeper into the posture. The muscles stretched are the extensors which include the calves, hamstrings, gluteals and latissimus dorsi. The muscles contracted are the flexors which include the quadriceps, psoas and part of the deltoids. When you practice on a sticky mat, you use the reaction of the feet and hands to lift into the posture, and do not have to engage the flexors. You can hang out with very little work being done to contract them. The effect of the sticky mat is amplified in the above photo by pressing the heels into a wall, a prop commonly used to move deeper into the forward bend. Again, the arrows illustrate the forces acting at the heel, which produce an equal and opposite reaction directed towards the hips. So what happens if we take away the mat or the wall? To make it clearer, let’s turn the posture upside down to give Navasana. Here we see that it is a mild forward bend where the anterior muscles need to be contracted to lift the trunk and legs against gravity. The arrows show the direction of action of the anterior muscles used to maintain the posture. The same applies to the above posture being practiced without a mat. The arrows show the overall direction of the forces required to prevent the feet and hands from sliding. The flexors are now fully engaged. In addition, the slipping action of your hands and feet on a floor rather than a mat creates instability. Removing your sticky mat challenges your body’s proprioception to make it ‘feel’ the movement more. The result is a far more active and mindful movement. 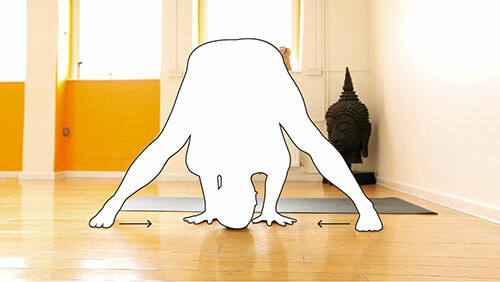 To prove this yourself, practice Adho Mukha Svanasana on a sticky mat, and then on a wooden floor. Initially you will find your hands and feet slip. Keep practicing however, and you will find they no longer slip as much. Your hands have not suddenly become sticky of course, all that has happened is that you have learnt to adjust your body subtly to produce the exact amount of muscle force to stop slipping. By discarding the sticky mat, the extensors and flexors are working together in a coordinated and balanced action which teaches the body useful and healthy movement patterns. The sticky mat over emphasises one set of muscles and encourages a loss of truly integrated movement. With the feet apart there is a natural tendency for the feet to slide further, shown by the arrows in the above photo, an action which is resisted by the sticky mat. In this asana we are stretching the hamstrings as we bend forwards and the hip adductor muscles because the legs are apart. We also use the quads and hamstrings to stabilise the knee. As we reach forwards our lats are lengthened and as we allow the body to draw down to the floor for the final pose our back extensor muscles lengthen. Many students, particularly beginners, use the advantage of the sticky mat to relax their adductors and take the weight onto the inside edges of the feet. The following variation-Baddha Padottanasana-helps us to explore the action of the feet and the adductors in a very stable position. The mat is now replaced by clasping the hands behind the legs so the feet cannot slip apart. First push the legs strongly into the arms as you move into the forward bend which can be achieved with confidence. Go to your limit and now lift and activate the arches of your feet-you can do this by pressing the ball of the foot and big toe firmly downwards, and observe how much firmer your feet feel on the ground. 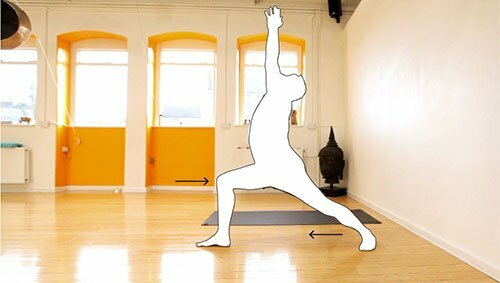 At this stage, gently move your legs away from the arms as if you want to draw your feet together. This is the action we want to cultivate in the final posture without a mat. The adductors are now contracting, and the feet firmly planted. Before moving to the final posture without a mat, let’s try one more variation to really feel the work the adductors should be doing in this posture. To move into a deep forward bend, you will have to engage the flexors and the adductors very strongly. It is these muscles which are being neglected in the usual posture done on a mat. Hold this position for 10 breaths, making sure the back is not rounding and you are lifting through the sternum. We are now ready to take the final posture without the sticky mat. The arrows in the above photo show the action required to hold the posture without the feet slipping. Again, as in Adho Mukha Svanasana, discarding the sticky mat will increase proprioception and enable muscles to work in a more balanced way. It teaches us to become more mindful or our body movement and limitations. If the above is not challenging enough for you, try it with socks! Practicing this posture with a sticky mat encourages the front thigh to be pushed forward, and the weight taken onto the inside edge of the back foot, often with the result of bending the back leg. The posture can be explored further using the wall as a prop. This encourages grounding the outside edge of the foot with a resulting strengthening of the back leg. Again, these movements have to be cultivated if working without the mat. The photo below shows the posture without a mat. Now there is a tendency for the feet to slip apart (increasing hip abduction) and so the adductors must work more, especially on the back leg. On the front there will be more emphasis on the hip extensors to resist sliding into hip flexion. The feet must grip more without a mat and so the feet need a greater contact area which is achieved as above by activating the arch and grounding the outside edge of the back foot. The front femur feels as if it is being sucked into the hip socket. The overall effect is that of drawing the feet together. From the above descriptions we can draw some important conclusions highly relevant to the use of a sticky mat. Essentially we are looking at synergistic actions which we learn as a motor program during walking and running. That is, hip and knee extension combined with plantar flexion of the foot / ankle. Although each muscle is working individually, the action is programmed into a single sequence (an engram) which is familiar to us and so requires less neural activity. Driving the heel down and lifting the arch of the foot combined with pressing the pelvis forwards to rotate the hip locks the lower limb joints more precisely – a sequence called ‘close pack’. During childhood we learn movement sequences such as lying, rolling, crawling, high kneeling, standing, side walk, forward walk, running etc. If we can lock into these sequences it becomes easier for a person to learn the action because the brain is familiar with the way the muscle groups and joints work together. What yoga is doing is to tap into these sequences and allow the body to function in an integrated fashion. If however we place too much emphasis on the use of a sticky mat, these sequences are blocked, leading to potentially harmful movement patterns which encourage unnatural movement combinations. Brian has been practicing yoga for a long time and is mainly self-taught. He completed the Primary and Intermediate Series with Sri K.P. Jois In 1990. He is currently working on Kechari Mudra without a razor. He holds a PhD in Biophysics and loves researching yogic practices from a western perspective. His book ‘the Art of Adjusting’ was published in 2006 and is used in training programs world-wide. He is the founder of Harmony Publishing which publishes out of print Yoga Classics including ‘Hatha Yoga’ by Theos Bernard and ‘Pranayama’ by Andre van Lysbeth, an early student of K.P. Jois in the 1950s. Chris is a Chartered Physiotherapist (MCSP). He holds a Masters degree (MSc) in Exercise Science and a Doctorate (PhD) investigating spinal rehabilitation. Chris is the author of twelve books on physiotherapy and exercise, including textbooks on sport injuries (Elsevier) Back Stability (Human Kinetics), stretching, and exercise therapy (Bloomsbury). He is director of Norris Associates, a private clinic in Northwest England. Interesting that Brians picture is of him on a mat. This was so interesting, and something that had never occurred to me before (I love those things!). The yoga mat – the final prop! Yes…the first step in letting go of the prop is realising that it is a prop! I was told by a lady from India that they do not use mats there, just possibly a towel or blanket. (should be no surprise!) And of course, we often do postures without, if we have to – in the park (grass) the mat just makes it awkward, I think. Or, if you teach and you move to the side wall to demonstrate, etc., you don’t take the mat along with you…..
Ah gee. My yoga mat is my space! I– can’t — let– it— go-o-o! It does bother me, the idea of all those yoga mats moldering in landfills. 🙂 but then a lot of yogis renew them every 2 or 3 years so the yogic landfill will grow exponentially! so a non mate doth an eco yogi make maybe?